Phat Boy Productions provides Windsor & Essex County with a variety of specialty lighting options to accent your event: led uplights, custom monograms, gobo lighting, pinspots, and intelligent lighting. Specialty lighting can transform your venue, big or small, into a unique and colourful space that can be customized to match your decor. Uplighting is one of the easiest ways to dress up any event by adding color and warmth around the room. Compliment your decor with uplight that can be customized to match your color scheme. Personalize your event with a custom designed monogram gobo light. Ideal for your dance floor or head table. 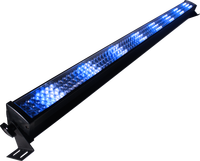 The colourful floor light bars are perfect for highlighting a heatable backdrop or an entire wall with even colour.